I use to wonder, when I heard old English sayings like “A pox on you and your house”, what it meant. Then I had kids….. 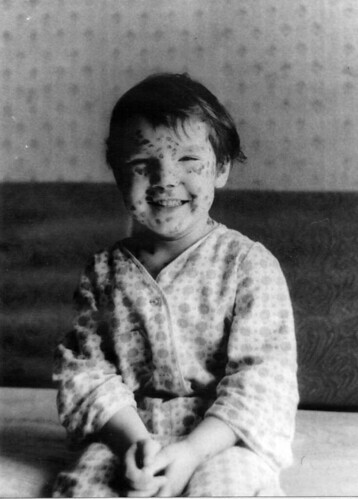 So, I’ve never had the chicken pox. At least not that me or my mom knows about. Maybe I had a mild case or maybe we all have some natural antibody. My brother hasn’t had it and my mom says she’s not had it either. She exposed us as much as she could but still, our bodies refused to get it. Whenever I’ve told anyone I hadn’t had the pox I always, to this day even, got that horrified look of wide-eyed concern, followed by the comment, “It’s really bad when you get it as an adult”. I guess I thought I’d just wait till I was around 80 or so and let it turn into the shingles. Sounds like a party to me! I moved to Hawaii for the second time in 1997 and two days before I left I went to someone’s house who had triplets (yep, some people have those) and after I sat and ate my nice dinner she tells me, “Oh man. It’s been rough here. The triplets have had chicken pox.” Then I got that wide-eyed, horrified and concerned look ‘cuz, you know, it’s bad when you get it as an adult and just before you board a plane to move to Hawaii. Needless to say the pox eluded me that day too. Now I have three kids and none of them have had the pox…well, until recently. I think Sylvie has them. There are bumps on her tummy, she threw up last night (it had whole blueberries in it and stunk really bad), and she had a fever today. So, I’m crossing my fingers, praying to the good Lord above and hoping that we don’t have a pox on our entire house. If I get it as an adult and in the summer no less, you may find me hiding under a bridge, rocking back and forth and rubbing calamine lotion on exposed skin. Here’s to raising kids that carry lots and lots of germs. This entry was posted in raising children by Tracie Bonjour. Bookmark the permalink. oh, no! I feel your pain…Jaidan just finished having them and Im waiting to see if Samuel and Esben get them. But I had them when I was little so I wasn’t as worried about getting them, although my skin itched something fierce in phsycological solidarity i think. Here’s hoping its not so bad in your house. Oh dear Tracie, I hope things are going okay over at your house.